When Paul Albrechtsen emigrated from Denmark in 1954, he had a vision – to work for himself, to earn a living, and to build a company that would thrive by focusing on quality service. 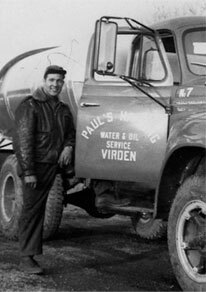 Paul’s Hauling Ltd was established in 1957, and by 1959 the company was operating eight trucks, hauling crude oil and salt water for the petroleum industry. In 1961 operations moved from Brandon to Winnipeg, and Paul’s Hauling soon began construction of a terminal building on Oak Point Highway. Since then, the company has continued to grow, building new headquarters, acquiring other transportation companies, expanding to other areas of the country, always with a single, driving mission: to provide clients with the highest quality transportation service available. Today, Paul’s Hauling has branches in Ontario, Manitoba and Saskatchewan. As our company continues to grow and develop, we embrace and nourish the dream and vision of our founder, continuing to build our success on good people and good service.